When removing the warm-up and neutral zone, Durbridge averaged 309W, or 3.98W/kg and burned 5101 calories. The day started hard with Durbridge setting his Peak One Hour Power of 364W, or 4.64W/kg in the first hour while climbing the Category 1 Port d’Envalira. His Intensity Factor® (IF®) for that hour was .91, meaning he held 91% of his Functional Threshold Power (FTP) for that hour. Durbridge bridged up to a small breakaway to make an elite front group including teammates Michael Matthews and Daryl Impey. He spent 120km in the break and had a Normalized Power® (NP®) of 330W while averaging 45.2kph (28mph). Near the end of the stage, Durbridge responded to an attack by Team Tinkoff rider Peter Sagan. To cover the attack, Durbridge put out his Peak 5 Second Power of 918W, or 11.7W/kg at 58.3kph (26mph). Amazingly, from that attack onward, Durbridge put out his Peak 20 Minute Power of 398W, or 5.07W/kg and averaged 96rpm. For the entire stage, Durbridge had a Training Stress Score® (TSS®) of 303 and an IF of .82. Heading east out of Carcassonne the riders will see 2 small category 4 climbs early on in the race at 38 km with the Côte de Minerve and at 57 km with the Côte de Villespassans. The remainder of the course is relatively flat and wide open so the wind will have an impact on the riders. The intermediate sprint point is at 113.5 km into the race, right before a short non categorized climb. The final 20 km into the finish at Montpellier will be flat but the cross winds could cause some havoc. Gusty winds made this stage very difficult. Durbridge was attentive all day and stayed at the front. As a result, his Peak Power values are spread throughout the stage. His Peak 12 Second Power came on a slight downhill section where he averaged 898W, or 11.4W/kg only 30km into the stage. His Peak 2 Minute Power of 453W, or 5.77W/kg was set at the 90km mark and he averaged 46.4kph (28.7mph) and 91rpm. In the middle of the stage, Durbridge set his Peak One Hour Speed of 48.6kph (30.1mph) while averaging 321W, or 4.09W/kg and burned 1158 calories. This stage had an amazingly fast finish. In the final kilometers, Durbridge put out his Peak 10 Minute Power of 377W, or 4.80W/kg while averaging 53.1kph (32.9mph). When the warm-up and neutral roll out are cut from the file, Durbridge has an Intensity Factor® (IF®) of .81 and a Normalized Power® (NP®) of 339W. Initially planned to end at the top of Mont Ventoux, the stage has been shortened due to the likelihood of strong, gusty winds at the top. The organizers have shortened the stage by 6.5km and it now finishes with a 9.5km climb up Mont Ventoux. Stage 12 of the Tour de France comes on Bastille Day and will be starting in Montpellier then travel northeast on fairly flat to rolling roads for nearly 112km before the climbs start. The first being Côte de Gordes at 4 km long and an average of 4.8% grade and then Col de Croix Termes which is shorter at 2.5km, but almost twice as steep at 7.5%. These are just warm ups for the shortened finish on Mt. Ventoux, a 9.5 km climb with an average grade of nearly 9%. Valgren’s Peak 20 Minute Power was set while climbing the Cote de Gordes and Col des Trois Termes. He averaged 352W, or 4.86W/kg at 25.5kph (15.8mph). His Peak 5 Minute Power came on the final section climbing the Col des Trois Termes. He averaged 404W, or 5.58W/kg over 1.67km (1.03miles) with an average gradient of 8.3%. For the final 9.5km climb on Mont Ventoux, Valgren averaged 276W, or 3.81W/kg for almost 45 minutes at an average speed of 12.6kph (7.8mph). Over the full stage minus the warm-up and neutral roll out, Valgren averaged 235W, or 3.23W/kg at 75rpm and burned 4155 calories. 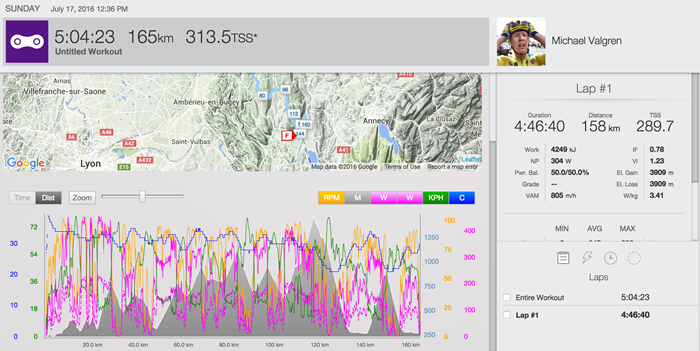 View Gatto’s full SRM power file. His Peak 20 Minute Power was set in the first 20 minutes where he averaged 365W, or 5.42W/kg at 31.9kph (19.7mph). On the final 3.23km climb to the finish, Gatto had a Normalized Power® (NP®) of 350W for 7:33. For the full time trial, Gatto had an Intensity Factor® (IF®) of .90 and NP of 346W. For the full 37.5km time trial, Gatto’s Variability Index (VI) was 1.03, showing that he rode very evenly paced. Stage 14 is a relatively flat course but at 208km it will be another long day in the saddle. Starting in Montelimar the course features 3 category 4 climbs in the first half of the day on the way north to Villars-les-Dombes Parc des Oiseaux. The first climb will be up the Côte de Puy-Saint-Martin at 20.5km. The next two categorized climbs are back to back with the Côte du Four-à-Chaux at 93.5km and the Côte d’Hauterives at 101.5km. The remainder of the course features some rolling hills before the gradient levels out over the final 50km. The flat and straight 3km run to the finish finally sets up nicely for the sprint teams trying to form leadout trains. Not surprisingly, Valgren’s Peak Power values came late in the stage. His Peak 10 Minute Power of 297W, or 4.10W/kg was set on the slight uphill near the end of the stage. After setting his Peak 10 Minute Power, Valgren went on to set his Peak 20 Minute Power in the final 15km to the finish. Valgren held 282W, or 3.90W/kg at 45.9kph (28.4mph). 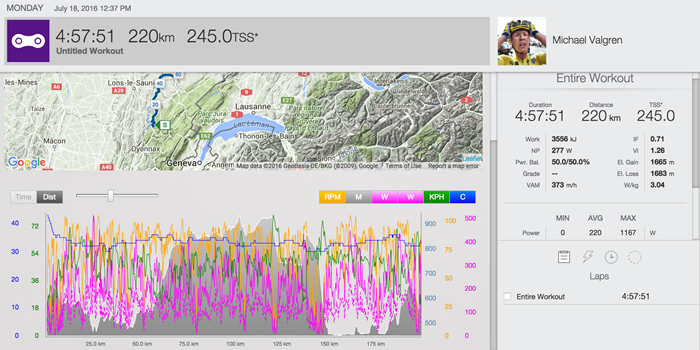 Overall, Valgren had a Normalized Power® (NP®) of 244W and burned 4027 calories. After a flat day the tour goes right back to the mountains. Stage 15 features five categorized climbs. Starting with the category 1 Col du Berthiand. Then at 23 km riders will face a series of lower category and non categorized climbs leading to the category 3 Col de Pisseloup at the halfway point and peaking at around 79 km. There’s not a single flat section on the course save for the two runs through Culoz. The real test for riders will come at 100 km where riders start to climb the Hors Categorie Grand Colombier, a 12.8 km long climb with an average gradient near 7%. This climb is followed by the Category 1 Lacets du Grand Colombier, which is actually part of the descent off of the same HC climb from a different approach, as the course double backs on itself, before descending back to the finish. Even with six categorized climbs over the stage, Valgren set his Peak 10 Minute Power just 20k into the stage. He averaged 426W, or 5.88W/kg on the 8.9% grade up the Category 1 Col du Berthiand. After his hard start, Valgren settled into a rhythm. He set his Peak 2 Hour Power of 271W, or 3.74W/kg between kilometers 55 and 116, which featured four categorized climbs. Up the 12.8k long Hors Category Grand Colombier, Valgren put out a Normalized Power® (NP®) of 343W and averaged 19.5kph (12mph) for almost 40 minutes. Over this difficult stage, Valgren averaged 247W, or 3.41W/kg, had an Intensity Factor® (IF®) of .78 and Training Stress Score® (TSS®) of 289. Starting in Moirans-en-Montagne, France, the course takes the riders 209 km to Berne which is the capital of Switzerland and the home of Fabian Cancellara. The course actually traverses the Jura Mountain range, but there is only one categorized climb on stage 16. That being the category 4, Côte de Mühleberg at 1.2 km and an average grade of 4.8%. 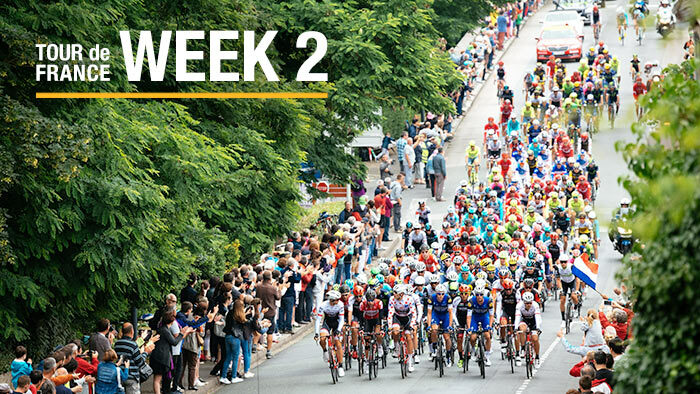 The finish could be exciting with its small 600 meter cobbled climb just before the last kilometer and then a completely flat sprint into the finish. After nearly three and a half hours of racing, Valgren set his Peak One Hour Power of 253W, or 3.49W/kg. His Peak 5 Minute Power of 381W, or 5.26W/kg was set on the Category 4 climb up the Cote de Muhleberg. 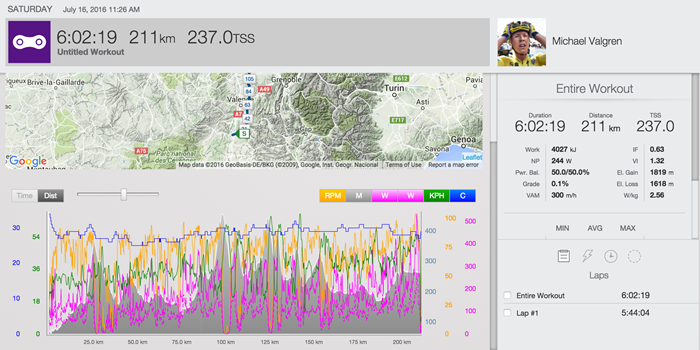 Over the full stage, Valgren had a Normalized Power® (NP®) of 277W and burned 3556 calories. View power analysis from week 3.